(Anonymous:) Our local clubs and tournaments discourage players of less than 10kyu from playing on 19x19 boards. I find that really unusual. I've been playing regularly on a full size board for about a year now, and I've just recently gotten to the point where saying I'm 'about 10k' would be a stretch rather than an untruth. I don't know if I would have stayed with the game if people at the club had been encouraging me to play only 13x13 for the past year. (Sebastian:) This is really unusual. 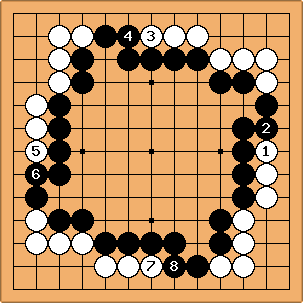 In our go club's small boards competition, the prize was a set of stones with a (plastic) 19x19 board, with the explicit request that the winner should play on 19x19 boards from now on. He is about 20k. Alex Weldon: I'm against beginners playing only on small boards for the same reason that I'm against them playing only handicap games; it's a different game. 9x9 is fine for teaching someone a bit about tactics, but once a player is used to the basics (and I mean really BASIC basics, like 20-25 kyu), they should start playing 19x19 IMHO. Of course, playing smaller boards is fine sometimes (I'm 1 dan and still play 9x9 sometimes, just for fun) but NEVER playing 19x19 until you're 10k? That's ridiculous. I understand the idea behind it; learn all about tactics first before starting on broader strategic issues... but I think it's better to learn both concurrently, by playing on a variety of board sizes, starting as early as possible. ChrisSchack: For 9x9, I would say it's a fairly different game. For 13x13, you're seeing some of the issues of 19x19, but territory is worth more ... this seems a good way to force people to need to unlearn things. Seems to go hand in hand with how some people teach the game, i.e. Capture One to Capture 5 before even talking about territory. However, I think it's very important to learn how tactical issues affect and are affected by strategic ones--otherwise, you're only getting a small part of the game. People who have only played on 9x9 until '10k' most definitely aren't 10k. Perhaps there's something to this idea, but it's too extreme. Does it make sense that new players shoud concentrate on 9x9 up to around 25k and 13x13 up to around 20k? Charles I believe Michael Redmond says 13x13 up to 13 kyu (maybe European 15 kyu). This is right for some people. That way you'd learn little real strategy until you're out of the social player stratum. I don't think this suits everyone; but there's something to it as a theory. DrStraw As I was reading this page I was trying to think of how I recommend the various sizes. I would say that once you can beat a good amateur dan player (say US 5D or Europe 4D) on 6 stones on any board size then you should definitely have moved to the next size. This would translate to about 25k for 9x9 and 14k for 13x13. However, I would consider this just a rule of thumb, with quite a bit of latitude either way. AndreasTeckentrup I heard a rule of thumb for 9x9 boards: play until you can beat a decent player (around 10-15k maybe) regularly taking 3 stones and then move on to bigger boards. If you can win taking 3 stones, this shows you got a grip on basic tactics and life + death. RafaelCaetano: Although playing only 9x9 until 10k is certainly an exaggeration, I believe most players move to 19x19 too soon, sometimes right after learning the rules. So people as strong as KGS 18k still make elementary mistakes such as not recognizing false eyes, basic nakade, hanetsugi on the second line, snapback, etc. In principle you could substitute studying problems for playing 9x9. But apparently not many beginners are willing to study problems systematically instead of playing. Hikaru79: Although I'm only 13-15k, I've had a lot of experience introducing others to the game, since I was the only go player at my school, and had the job of introducing everyone else to it. At first, I taught them using 9x9's because everyone said you should, but I realized that if I used 9x9's as a teaching tool for too long per person, they would build habits that would then take almost as long to break. A typical 9x9 student would then spend their first 19x19 month as one of those players who starts a fight in a corner which then spreads across the board as one big surrounding contest, and which usually ends in the capture of a large group. After seeing this so many times, I've become under the opinion that 9x9's should be used very little, if at all, in teaching newcomers. It may be more daunting for them to play 19x19 right away, but at least when they get the hang of it, they don't have to relearn everything again. As for only being 10k when switching up, I feel that it would be practically impossible to reach a REAL 10k on a 9x9. Perhaps they mean being able to beat a regular 10k, which is completely different. I can beat people way over my rank (1-dan) on 9x9 whom I would normally have no chance against. Just my 2 cents. 40 Kyu and weaker they also used to play 'capture go', but current helpers (including me) do not like that at all - I don't see that anymore. Up to 38 kyu 9x9 is played. 30 Kyu - 13 kyu play 13x13 mostly - but see below. 12 Kyu and stronger play 19 x 19. 18 Kyu up are encouraged to play 19 x 19, but if the weaker player wants to play 13 x 13, 13 x13 it is. Though the competition clearly favours 13x13 (some play 3 games a week and there is only time for one 19x19 game), there is honour perceived in playing 19x19 - after all, the strong play 19x19. BobMcGuigan: Aside from very basic tactical knowledge, beginners lack appreciation for how moves in one part of the board affect other parts of the board. If they play on 9x9 boards this interaction becomes apparent very soon. Also they learn many basic tactics in fighting and the endgame. Moving up to 13x13 at the right time can continue this learning process because things are still close enough together. So I think beginners will learn more good habits of thought than bad if they start on small boards. Staying on small boards up to 10k seems extreme but if the rest of the club members are strong dan players and they don't like to use handicaps higher than nine stones, the 10k player will have to play on small boards to equalize the game. Bill: When I learned to play go, I never played on a smaller board than 19x19. As a result, I got used to whole board thinking early and avoided some bad habits. OTOH, I made embarrassing elementary errors in life and death. As a 4-kyu I did not even know the basic dead shapes! Now I think that beginners should start on the 5x5. When they can win as Black against best play, they should move up to the 7x7. When they can win as Black on that, they should mix them up between the 9x9 and the 19x19, gradually phasing out the 9x9. I do not see much pedagogical point to the 13x13. BTW, when I teach kyu players, I often have them play Black against me on the 9x9. Charles I think 13x13 is very useful. Not perhaps for those who are the quickest learners; but for everyone else, 13x13 offers a great deal in the range about 25 kyu to 18 kyu. That covers most self-taught players, in fact. Bill: I think that 13x13 go is a fine game in its own right. :-) Pedagogically, it seems to me that the 9x9 is fine for tactics. As for strategy, the strategy for the 13x13 seems sufficiently different from that of the 19x19 that you might as well just go straight to the big board. Charles At this time of year my club has a group of beginners (30, or more). Some of them outgrow the possibilities of a 9x9 in an evening, when they play each other. So we suggest they use a 13x13, and that gives much more scope for interest, up to 20 kyu. Note that they are learning some basic strategy in parallel with life-and-death at this point. More generally, we use a 13x13 Board as club handicap games in tournaments: it means that handicaps can cover over 20 grades. I don't rate 13x13 as an interesting game (to me), but that's partly because I play a fair amount of it. High-handicap 13x13 with free placement and quick time limits, which is what we play in our events, is quite good fun, because you get a very varied set of games through an evening. Klaus: Some time ago, I started to use a new board size: 7x7! It is fun to play, and one can learn a lot about tesuji like the two-stone edge squeeze. Carelessly losing 2 Points in yose will cause disaster and a lot of reading is required to handle this size. An example can be found at 7x7 game. Klaus: A RecentChangesJunkie can`t wait? Well, I forgot to mention, that Black should not be allowed to play on 44 with his first move! Start with a 9x9 board, at a high handicap. Each time I beat the computer three times at that handicap, I lose one handicap. What do you think about this method of gradually moving to 19x19 boards? HighQ: For me, mAsterdam's point is key: you can play many more complete games at 13x13 rather than 19x19 when time is tight. Maybe this outweighs the 'having to relearn stuff later on' problem until you get quite good? I've been pointed towards KGS by others here so I'm hoping 13x13 games there will fit into the 45 mins or so I get each evening . . .
Niklaus: I don't think the 'having to relearn stuff' problem is that big. A lot of what you learn on the small boards carries over to the 19x19. For example if you get strong at live & death and fighting by playing lots of 9x9, it will help you a lot when playing 19x19. Of course there's additional stuff to be learned for the big board, but I don't think you'll pick up bad habits playing 9x9 or 13x13. Acid? : I have been playing hundreds of 9x9 games in the past week and a half. I think it is really helping me. By playing lots of 9x9 games I have been learning the correct moves in certain situations that often occur and I memorize how to counteract. I have a friend who started around the same time as I have. He has been playing 19x19 games and still makes many elementary mistakes at moves which I learned and mastered after my first hundred games. I played my friend and every time I kill him with out making a sweat. My personal opinion is that a beginner should play hundreds of 9x9 games until they start to realize what I am realizing; note where their room for improvement is and play until they improve. I observed many games. I can beat 25k-23k players on KGS when I have white, but I still think that I have room for improvement in life and death situations. A beginner should play 9x9 games to learn e.g. life and death, then move up to 13x13 to get a better feel of the game and eliminate any bad habits they got on 9x9 boards. I agree with what someone said before (too lazy to look back and see who) that 9x9 boards create bad habits. That's why they should move up to 13x13 and play on that level until they feel they have broken those habits. So in general, I think that players should decide when they are ready to move up to the next level. Rakshasa: I'm a KGS 2 dan who's played for 1.5 years, and the past months i've felt my reading slipping. Getting bad habits like not bothering to read more than one variation. So i decided to only play 9x9 till i got it back. Seems to be working. So who is 9x9 good for?... IMO everyone could use some time spendt practicing pure reading skills in tactical situations. 19x19 doesn't give you that chance, as you must keep in mind the big picture and you get in the habit of playing moves you haven't read out due to time. Quicksilvre: I am a 29K on Dragon and 25K at Kiseido, and I've been playing 19x19 since almost day one. It took me a long time to get my first win in an even 19x19, but I did get one eventually. I played on them even when I was as low as 33K (before DGS forbade rankings below 30K). I do, however, prefer 9x9 go--I can command the game with much more ease. Still, I think players, once they have maybe a couple dozen games under their belt, should start to experiment with 19x19, 13x13, or even other sizes. I've played 5x5, 7x7, 9x9, 10x10, 11x11, 13x13, 15x15, 17x17 (I think), 19x19, and 25x25. All of them have different challenges and strengthen some area of play--which can be translated back to 19x19. So, I guess my conclusion is, try 19x19, and other board sizes. Tirian As a 21k player, I agree with Hikaru79's assessment that you can spot the 9x9-weaned players a mile off with their incessant contact plays and failure to make tenuki. More often than not, the game ends when I surround some dragon of theirs and they don't notice that it has no eyes until it has three liberties left. I'm certainly not strong enough to advise people on how to learn, but it seems to me that if you play smaller board sizes that you should play at least some portion (20%?) of your games on the full 19x19 board. In that way, you can recognize the parts of the smaller game that will contribute to an improvement in "real" Go while not getting addicted to the tactics that only help in 9x9. ilan: Actually, I believe that 9x9 is too large a board for learning the game, and that it should be replaced by 7x7. In my experience, I was able to understand 7x7 quite well at about 12k strength, and playing 1000 games on it was equivalent to reading a book about the endgame, that is, when I looked at endgame problems, I already knew many of the answers. On the other hand, I have found 9x9 almost as confusing and daunting as 19x19. Agilis I started playing on 9x9 because everyone said so. But because I was reading SL from the day I started, I moved to 19x19 on my 3rd game. I was eager to move onto a board that was more forgiving of my reading mistakes because there was room to recover from them. What I found 9x9 and 13x13 does teach very quickly are cut and connect fundamentals and 'edge physics' - all those weird things stones do when on the second and first lines. You bump into edges sooner on a small board and a mistake on them costs you a large percentage of points. Even now I'm relatively weak at life and death, but compared to people my level (15k) I can still have a shot at getting ahead with a good opening by looking at the whole board. Bazmonkey? I'm 14k on KGS. Self-taught n' all, and I only played 9x9 games when there was a significant skill difference between the two players. Hardly ever 13x13, unless time was a concern. I think 7x7 gives too little of the experience of a 19x19 game. A 7x7 is just a bit more of what you see in a 9x9, minus all but the rudimentary strategy of the game. The 9x9 at least has a glimpse. Playing roughly equal players, I personally feel 19x19 is good after 22k-ish. Assuming you're also playing stronger people from time to time, and possibly high-handicap games with weaker players, you'll learn the strategies behind it while stumbling upon some of them yourself in play. Tas: I was tought the rules of go by a friend, who was given the game for christmas. And after that I've tought a few players myself, allthough I'm still extremely weak myself. Discovering this page is my (our) first actual link to organized go, and go theory. So no one told us to play on small gobans. We very rarely play go on other sizes that 19*19, and if we do, its because we haven't got the time, or only have acses to a chess board. I have a feeling that those who say that it is better to learn it all at once, rather than developing bad habits on the smaller boards, are rigth. Though we definitely have much to learn on both tactics and strategy. Reading this page for a few days and then playing a little on the internet, enabled me to wipe my friends even with handicap. Harleqin: 9x9 clearly stresses tactics and endgame, which is good for a start. 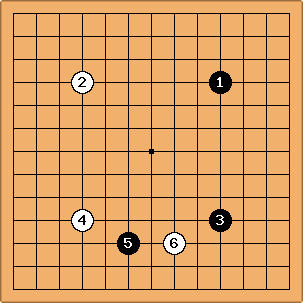 I think 13x13 is very useful in teaching go because it is big enough to steer the pupil's eyes away from the local situation and also has room enough to teach a lot about shape. I recently watched how a high dan player teached a promising beginner on 13x13. In his comments he focused entirely on shape and on the basic instincts regarding the direction of play. For this, 13x13 seems ideal. Everyone who has understood the basics should also play on the 19x19 board (though perhaps not exclusively in the beginning) to get a feel for it. I think everyone regardless of rank should from time to time play on different board sizes, to get new perspectives on the game. Malweth: I learned how to play solely on the 19x19 board - I believe that my first 9x9 game was after I'd broken 20k, and I'm positive that my first 13x13 game was when I was SDK (and versus a ~25k child). There are important things to learn at the 25k level, and as important as life and death is, the opening is IMHO more critical. Basic shape life and death problems take a close second. Look at it this way, the most important part of the game is the fuseki (joseki aside, of course, for the 25 kyu). 1) Learn the rules 2) Learn the big points and why they are big (start with the 3-4 shimari, then the kakari) 3) Simultaneously with #2, learn the basic nakade. 9x9 is good for time purposes - it does teach good tactics, but should be used in conjunction with 19x19. I personally don't find much value in 13x13. I think it is better to play half a 19x19 game than to complete a 13x13 game, not even discussing that playing quickly (15-20 min absolute per side) is perfectly fine for weaker players. Pashley Since I'm only about 12 kyu, I don't usually teach, but recently I have found myself introducing some complete beginners to the game. I chose to do that on a 13 by 13 board because 19 by 19 takes too long and might overwhelm them, and it seems to me 9 by 9 over-emphasises tactics at the expense of the strategy that makes the game so interesting. One of them won her second 7-stone 13-line game from me, so I feel it is working. fractic: Recently I've also been trying to teach a few total beginners. Normally I would start with 9x9 but I gave 13x13 a try recently. It was quite a success actually. I played 4 games in about an hour and the progress that black made was very noticable. All games where with 4 handicap stones. In the first game Black pretty much only made moves on the four bottom lines. But by the fourth game he was really hanging on to his initial lead and only lost because he mishandled an invasion. axd 14k: In our club we have the feeling that 5x5, 7x7 and 9x9 is an interesting way to introduce the game to absolute beginners. I always remind everybody around me that 9x9 is full of tactically very interesting situations. And I more and more remind newcomers that they should never put 9x9 aside as soon as possible, but remember that it remains an important variant of Go. I think that some people tend to associate 9x9 with beginner's Go. This is wrong. To me, 9x9 is like a point in tennis (while 19x19 is the match): a lightning quick exchange between players. Actually I prefer to compare 9x9 with two samurai in a confrontation (and 19x19 with the battlefield). I may have a somewhat distorted view on this, but I see the situation as a lightning short encounter, tense and packed with technical skils. Karl Knechtel: In my planned go book for beginners I am actually going to start by exhibiting the game on 3x3. Actually, a few steps back from that - building up the rules from scratch, through StoneCountingScoring? to Chinese rules and later Japanese rules (on 9x9). I used 13x13 as a stepping stone to the full board and I think this is a viable option, although I regret my assumptions that it would play in a way "in between" 9x9 and 19x19. I have actually found, in retrospect from watching beginners on this board, that the 13x13 board is actually kind of unique. 4 "classic" 3-3 invasions in a 4-stone game on 13x13, etc. Admittedly, Black is going to be better off by picking better direction of play (pushing the corners towards each other to claim territory on two sides or to use the end of the wall from one against the other), or perhaps playing double-hane lines. But by my counting, White has about 40, and Black has 49 now - so assuming a komi of 6.5 and thus a handicap stone value of 13, White has caught up about 43 points by doing something that would be considered unthinkable on a 19x19 board. robw: I dunno.. my feeling on this topic is that it is silly. 9x9 does have its uses.. largely because it is not too long and you can focus on tactics. The only reason I could see a go club telling people not to play 19x19 until they are strong is if it is greatly annoying other players to have to play a game for 40 minutes, only to crush the weaker player. Either that or stronger players want to impose some sort of glory on reaching a certain rank. Either way.. it seems like a poor practice and almost like stronger players trying to pretend they are elite. This seems like a Western world invention. Has ANYONE heard of go club in Asia saying you can't play on a 19x19 until you reach a certain rank? Look at Hikaru no Go.. they play 19x19 in the go club and 19x19 seems to be throughout the series. Does this imply that many strong players would look at the book and scream, "Hey!!! You aren't 15kyu yet!!! Get off that board!" To tell a beginner that they should stay away from 19x19 seems like some silly little practice. I would think you would start someone on 9x9 because it is fast and you can quickly show flaws in someones basic understanding of the game. I could also see watching a weak player on 19x19 and telling them that they should play SOME 9x9 to get some tactical practice. But to make some sort of rule about when you can finally play 19x19 is totally ridiculous. I don't know.. but I have a good feeling.. that such a rule is extremely rare in Asia. Anyone heard of this anywhere other than some Western clubs? "Our local clubs and tournaments discourage players of less than 10kyu from playing on 19x19 boards." I suspect that sentence could be ended after "10kyu" and still be true. Of course experienced players want, and have every right to, the stimulation of playing against difficult opponents. Of course no one wants to waste an evening playing out an overwhelming victory against someone who doesn't know when to resign. And I'd be happy to accept a teaching game from a skilled player on any board size. But not letting newcomers play real Go until they're 10kyu? That sounds more like not wanting to be bothered with newcomers at all.